While giving books as gifts is one of our favorite things to do, there are times when a standalone book given with a little something extra will truly delight the recipient. This week we've rounded up 10 musical toys to give along with your favorite musical books, and to help get the family band you've always wanted to start off the ground. 1. Toy Trumpet - we both have this toy trumpet in our homes and when kids spot it they literally can't keep their hands off of it. The same company also makes a darling saxophone. 2. Harmonica- the harmonica is a little gem of an instrument, inexpensive but fun to play and you can make so many sounds with it. Great for kids who haven't mastered whistling but wish they had. 3. Hand Bells- these handbells are my favorite toy handbells because of the straight smooth handles and the sound quality. I've compared them to the Schylling set and I prefer these. 4. 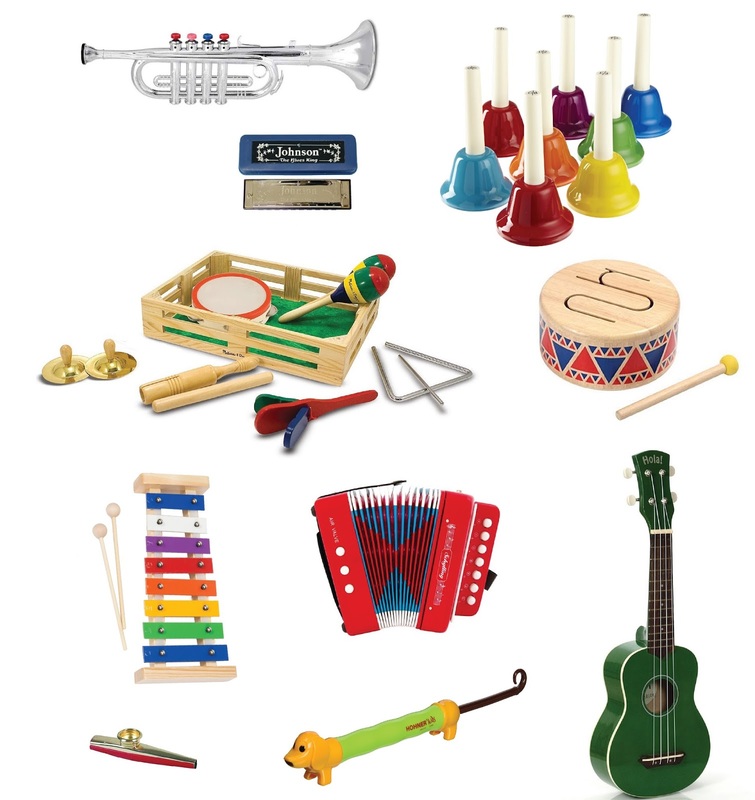 Melissa & Doug Band in a Box- this box provides lots of instruments at a totally reasonable price point. The instruments are small and great for sing alongs for the under 4 crowd and the variety ensures there are enough to go around during playdates. 5. Plan Toy Drum- we've had this toy drum for 7 years and it has withstood a lot of abuse. My favorite thing about this drum besides how adorable it looks, is that the sounds it makes is very pleasant. It's not too loud, and it is a good beginning sound maker for little ones. 6. Toddler Xylophone & Kid Xylophone we had to give you two xylophone options because we think they are such a fun introduction to playing songs with notes. 7. Schylling Kids Accordion- this toy is adorable and I would be lying if I said I haven't played with it myself. However, this toy accordion is not for people who are sensitive to loud and jarring sounds; it can be quite startling if you aren't expecting it and may not be the best for fostering good relations with your neighbors if you live in close proximity to them. 8. Metal Kazoo- a classic for a reason. This little guy can be easily transported and makes plenty of noise with little effort. 9. Puppy Slide Whistle- Slide whistles are another fun mouth instrument that my kids really enjoy and that I find more pleasant to listen to than a traditional whistle. Isn't this puppy version almost too cute? 10. Ukulele- for older kids, we love the idea of a string instrument. We own a great little toy acoustic guitar that is no longer made, but the next string instrument we buy will be one of these ukulele's. They come in a whole slew of colors.